Guess who else believes the devil is stealing his money? Despite what popular opinion is about the guy’s psychopablum and mushy mandates of the Gospel, I really have never heard of this guy beg for a dime. What with the books, the appearances (presidential and every other type) and his sizable bank account, I thought at least he was above this. Not too long, we tagged the Wall with the bemoaning of one Rod Parsley who believes Satan is stealing his cash. Now while I firmly believe Ol’ Slewfoot is fully capable of such a diabolical act, we discovered this $3 million beg was not the case. Turns out some “teacher” at World Harvest Church’s baby sitting factory for BeBe’s kids… er, daycare pummeled some kid, the parents sued and oh yes, won $3 million from Parsley! Spare the Rod, spoil the child, I say. State of Ohio – 1. Devil – 0. You twit. Fast forward to the aforementioned (and linked) story from the New York Times and we find a destitute and dang near poverty-stricken Rick Warren [honestly, I’m surprised]. In an urgent letter posted on the Saddleback Church Web site on Wednesday, Warren says expenses are up because parishioners are out of work and ”the bottom dropped out” when year-end donations dropped dramatically. He asks parishioners to donate $1 million before the new year to keep the Orange County church out of debt. This is a pill, albeit horse-sized, that’s much easier to swallow. It’s no secret the economy blows and people are praying for God’s understanding and mercy as the tithe stays in the storehouse from it which it resides for now. Here’s an idea, mands of Gawd (shout out IST): Exercise the same faith you espouse when praying for the throng of folk who, you know, are near poverty, have no money to tithe because they need to keep on the lights and are believing God for more than just you staying on T.V. If the Lord is big enough to answer their 911 calls to heaven – and he is – then he “sho’nuff” can answer yours. However, forgive our Savior if he’s a little preoccupied with those who probably can’t get a loan and doesn’t have the cache reserves that you two have. Happy New Year. Sorry. Not impressed with your argument. But considering some big name, hypocritical, money-grubbing church leaders, I don’t blame you. 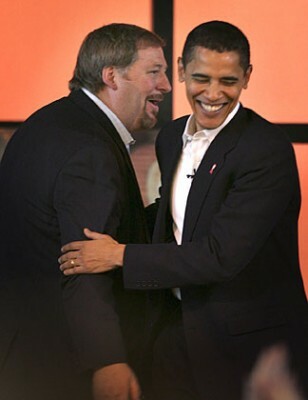 However, with Rick Warren (as you seemed to imply), we would expect things to be different. After all, he has led the way for Saddleback Church to give generously in the international work they do in helping the impoverished and in providing clean water and food relief. He himself has also given quite generously of his own funds and does not receive any salary from the church. It would seem that Warren and Saddleback have helped set a standard for churches that actually serve people like Jesus did. Often times church people fail to give others the “benefit of a doubt.” But guess what? Often times it goes the other way around also. just announced he raked in $2.4 million [said with the little pinkie held to my mouth]. No wonder he has that sheepish smirk on his face. So downletting but I suppose nothing should surprise us in 2010. Carry on Christian soldiers on the Wall. We have work to do. Seriously. You make this sound like a bad thing. This is $2.4M that is not spent on personal entertainment devices and latest fashions but rather to go toward an organization devoted toward helping the community, an org that has enlarged their budget toward helping local families through the economic downturn. They asked for 900Gs to meet their commitment and they got 2.4M. That many more families will be helped because of those who stepped up to donate. Why is this a bad thing? Thanks for the mention s77. Not only is Dobson taking his ball and starting a radio show with his son – his son is begging for money for his daughter’s medical bills. While there may be a mantle to pass to the son who didn’t want it previously, it may be Dobson’s idea of payback in the Fotf Daly/Dobson behind the scenes squabbles. Look up Ryan Dobson, he has an infant daughter with heart problems and is asking people to pay her medical expenses. If any of you have a password to Guidestar look up Purpose Driven Ministries 07/08 – 74 million. That’s one of how many organizations Warren has? Latest from Rick Warren – it’s a miracle. ‘The Miracle’ even. Bene D, we can always count on you to find some dirt hidden in the recesses of these jackleg swindlers pockets. Nice indeed. Why haven’t the “Warrenites” come to the rescue and given their guru the do re mi? I’m positive one offering would easily cover the 900k he’s pleading for. I’m just as positive that by manipulating this story into a national news item certain powers that control the purse strings of the present administration could easily provide the Rickster a little “stimulus” to see him through these hard times.Or maybe the “annointed one” in DC will cut him a check as repayment for services rendered.Isn’t that how these things work? What a pathetic joke of a man. I have often wondered what satan did with that three million dollars he stole from Rod Parsley. But isnt it normal to issue year-end appeals for finances? Why do these guys have to stir up the drama pot so? happy 2010! The future is now. “Slightly shady”? I think you give the guy too much credit. Honestly, the thing is, Warren could make up this $900k very easily by writing a check if he were so inclined. He’s not. And the shepherd told the shearers,”Cut’em close boys, they can make it thru the winter”. Where were you on New Year’s eve? Jesus was in Vegas.